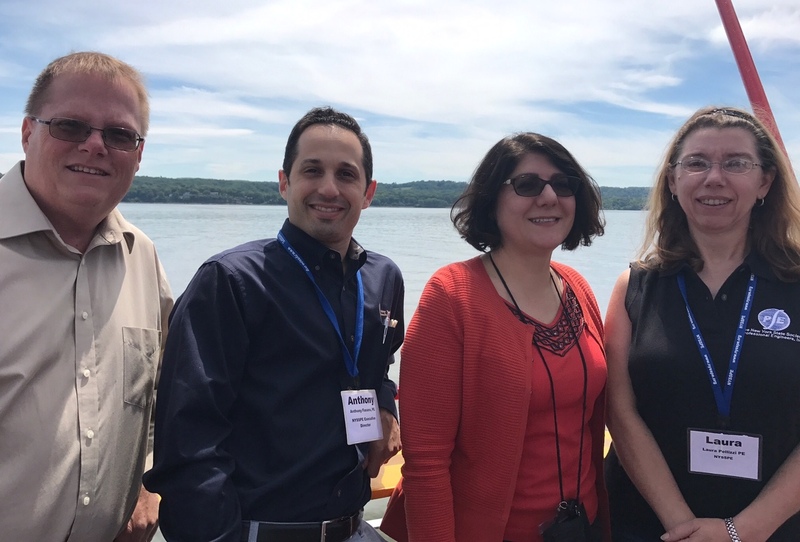 The New York State Society of Professional Engineers (NYSSPE) hosted their 2017 Annual Conference last week in White Plains, NY offering up to 9 Professional Development Hours (PDHs) to participants including an extensive 2 PDH boat tour of the construction of the New NY Bridge. Members and participants took the 4-hour boat tour up the Hudson River to see the New NY Bridge (replacing the Tappan Zee bridge) construction site up close and personal. The New NY Bridge Project, which serves to replace the existing Tappan Zee Bridge over the Hudson River in suburban New York City, is one of the largest ongoing bridge construction projects in the US. This $3.9 billion dollar project is scheduled for completion in 2017 and is the first design/build project ever undertaken by the New York State Thruway Authority (NYSTA). With a twin structure more than 3 miles long over the Hudson River, many construction challenges were encountered. 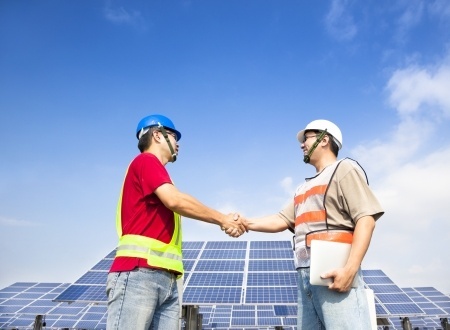 Along with the need to meet numerous environmental conditions, partner with local communities, as well as ensure the uninterrupted use of the NYS Thruway by the traveling public, this project offered opportunity for unique engineering solutions. Those were the words of Jamey Barbas, PE, and Project Director for the New NY Bridge project as she accepted a special award on June 8th from the New York State Society of Professional Engineers (NYSSPE). 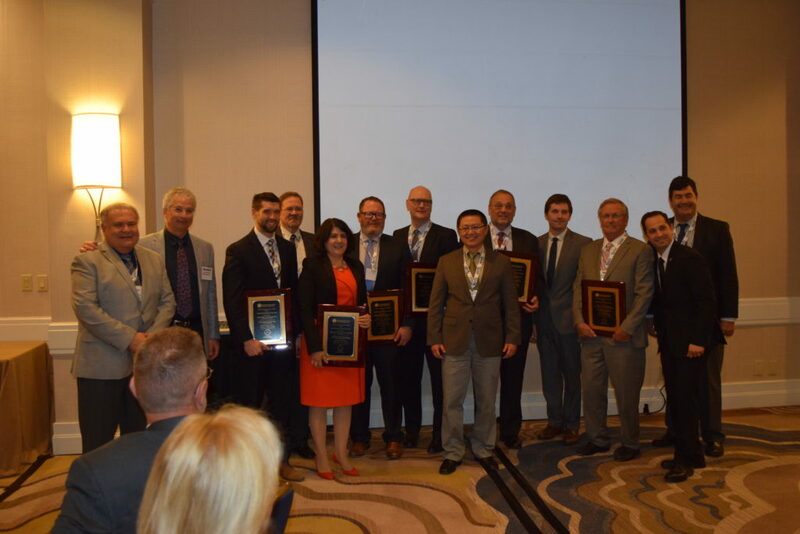 The New NY Bridge, one of the largest bridge projects in the US, was awarded the NYSSPE Project of the Year award, which is selected and presented by the Professional Engineers in Construction (PEC) interest group of NYSSPE. 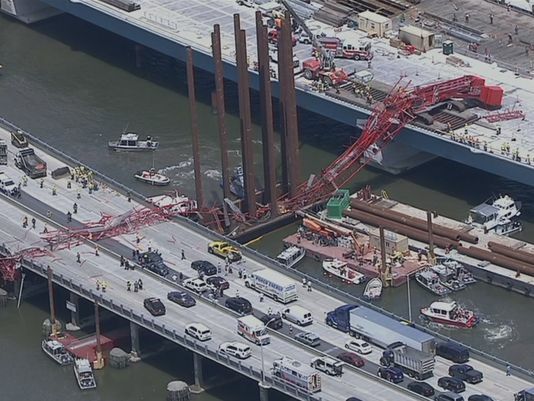 Aerial photo’s of a construction crane that recently collapsed onto the Tappan Zee Bridge. You probably heard about the recent construction accident on the Tappan Zee Bridge where a crane boom collapsed. The New York State Society of Professional Engineers has been monitoring the situation and keeping up to date with all news relating to the investigation. While there has been some talk about rushed construction, due to the large fines being imposed on the contractor for delays in re-opening the existing bridge lanes, nothing has been confirmed. We will continue to monitor the situation as the health and safety of the public is always our primary mission. It is nothing short of a miracle that there were no major injuries. Click here for a recent article on the accident from The Journal News. NYSSPE Upcoming Event: Meet New York State Thruway Authority Executive Director Thomas Madison, Jr. The New York State Society of Professional Engineers (NYSSPE), Westchester-Putnam Chapter will be participating in an event entitled Meet Executive Director Thomas Madison, Jr. – Learn what the Thruway Authority is Planning. Leading decision-makers in the Westchester/Hudson Valley region will present their projects, outlook, and opportunities for public-works infrastructure projects and private-sector development and expansion. On February 20, 2013, the New York State Society of Professional Engineers (NYSSPE) Rockland County Chapter held an Engineers Week Luncheon on the Tappan Zee Hudson River Crossing Project (Tappan Zee Bridge) – Pile Installation Demonstration Program. The event was held at the Palisades Mall in West Nyack, New York.